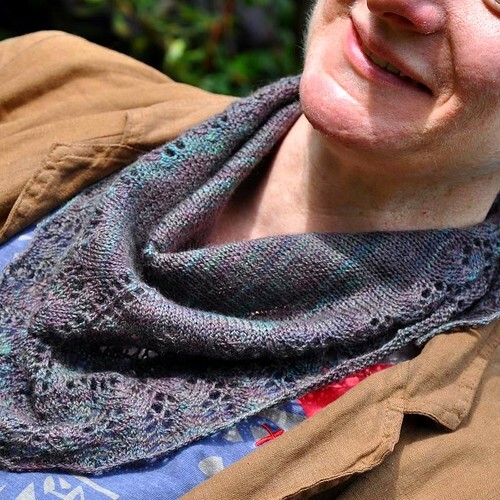 Notes: I made this shawlette as a birthday present for a friend – one of my rare knitting projects for someone other than myself! She is one of the few people I know who really appreciate a hand-made gift, and is such a good friend that I am happy to knit for her. This was incredibly quick to knit, taking just one weekend to knit. Both the stocking stitch and the lace sections were fun and easy, without being boring. I loved it, and luckily my friend does too! 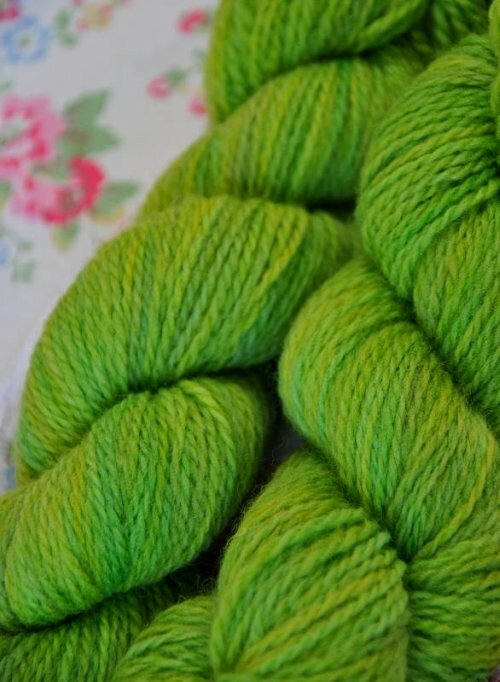 My first attempt at dyeing yarn. 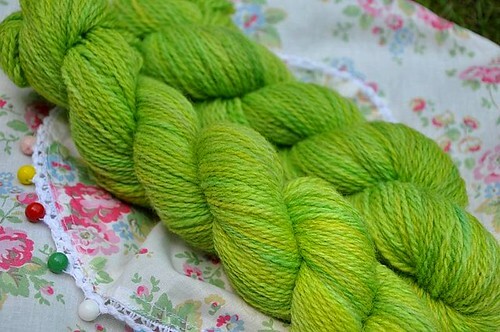 I used Procion acid dye, and painted the skeins with blue-y and yellow-y greens. I made lots of mistakes which resulted in the yarn looking nothing like how I imagined it would. At first I thought I would overdye it. But, after reskeining and living with it for a few days, I am actually pretty happy with the colour. There is going to be a new baby in our family in November. * I’ll give more details later, but for now suffice it to say that there will be a fair amount of baby knitting going on here in the next few months. To kick off, I want to make a cot blanket. 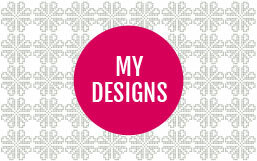 We found out this week that the baby will be a girl, which means I could go yarn shopping and make a start on it. Inspired by Kylie, I decided to crochet a granny-a-day blanket. I love Asiye’s restrained use of colour in her seablue afghan, and have decided to make this blanket in just four colours: cerise, lilac, pale green and white. 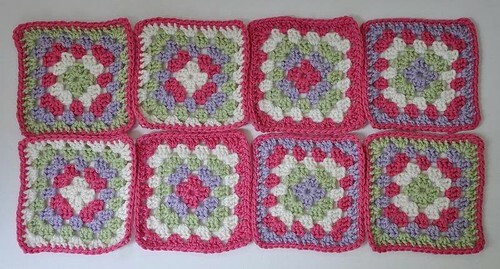 My first idea was to make five-round squares with both the centre and the edge of each square pink. However, I thought these looked a bit uniform, and were also too pink for my liking. My second idea was to make four-round squares with an edging of single crochet in pink, but after making a couple of them I thought that they were too small. Feeling rather like Goldilocks in my search for the perfect porridge granny square, on my third attempt I made five-round squares with an edging of single crochet in pink. I kept the same colour order in each square, but with the colours progressing from square to square. I love this version! Having found a combination that I like, I then got a bit carried away and spent the rest of the day making them. So, eight down, fifty-two to go! 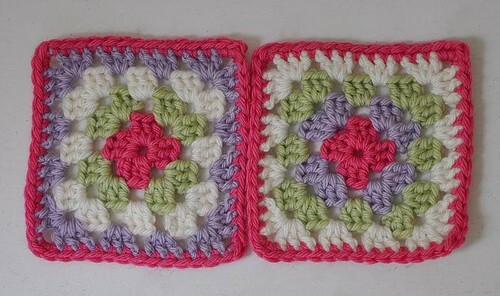 If you don’t know how to make granny squares, and would like to have a go, there is a great tutorial on Crochet Cabana. 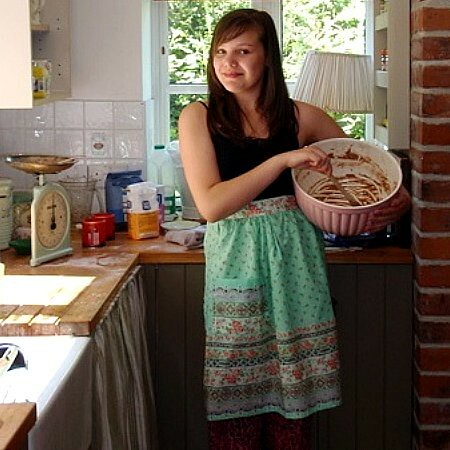 A number of you asked for the recipe for Alice’s Amazing Chocolate Cake. So, here it is! Cream the butter and sugar together until you get a pale, fluffy mixture that drops off the spoon easily. Add the eggs and then the flour and cocoa powder. Divide the mixture between two baking tins, and cook for 30 minutes at Gas Mark 4. Cool the cake then fill and ice with butter icing, made from about 2 dessert spoons of cocoa with about 2oz butter and 4oz icing sugar. Alice’s cake was topped with Maltesers. Enjoy! ps: If you’re not in the UK, 1 dessertspoon is the equivalent of 2 teaspoons, and caster sugar is superfine sugar. 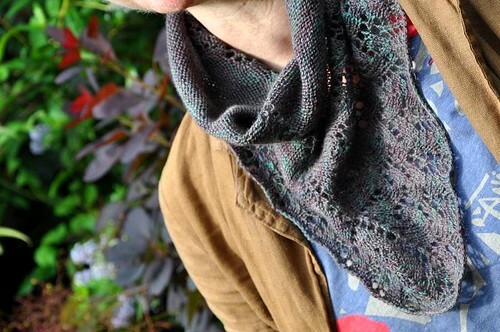 Next time I should have some photos of what may be my quickest ever lace project. There are over 1,300 of them on Ravelry at the moment. Recognise it? Pattern: Over the Garden Wall Socks, March’s Socktopus Sock Club pattern by the very talented Lou and Emms. Modifications: I made a simplified version of the pattern, with just one trellis lace panel, not two as specified in the pattern. I also omitted the icord vine that was supposed to grow up the trellis pattern. It looked pretty, but reminded me rather of a snake – not good for a snake-phobic knitter! The cuff was meant to be an incredibly pretty daisy pattern to top off the trellis wall. It looked lovely, but unfortunately was too tight for my heels. 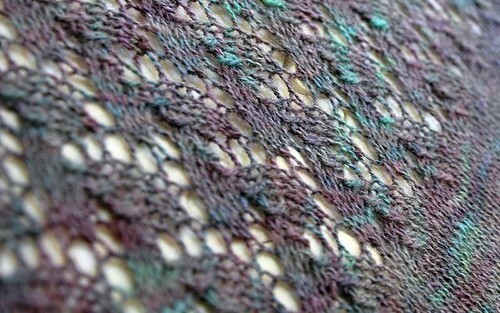 Instead I knit 5 rows of seed stitch and finished off with a frilled cast off. 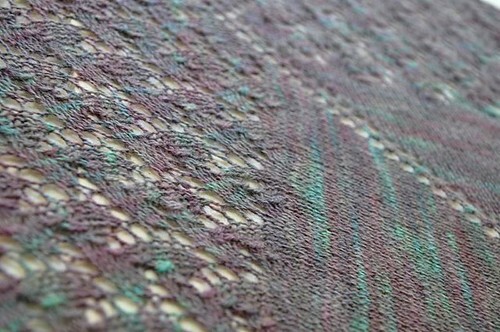 Notes: I adored the combination of this pattern and the gently variegated yarn. 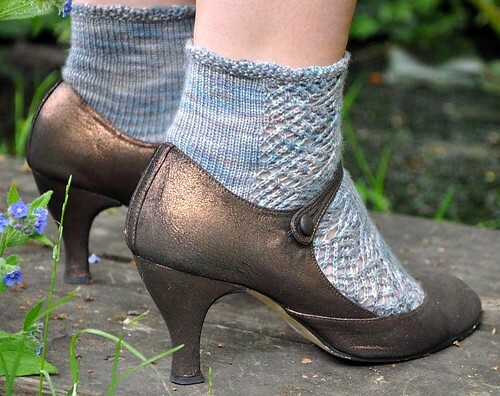 The stocking stitch showed off the grey-blue colours, reminiscent of an English sky, while the trellis lace panel added just enough detail to make them interesting, pretty and girlie. I love them!